Standard Hotel Ice Skating Rink Opens Below the High Line! The Standard Hotel Ice Skating Rink Opens Below the High Line! It may be a balmy 65 degrees today (hello, climate change), but it’s the week after Thanksgiving and that means only one thing: it’s time to get in the holiday spirit! 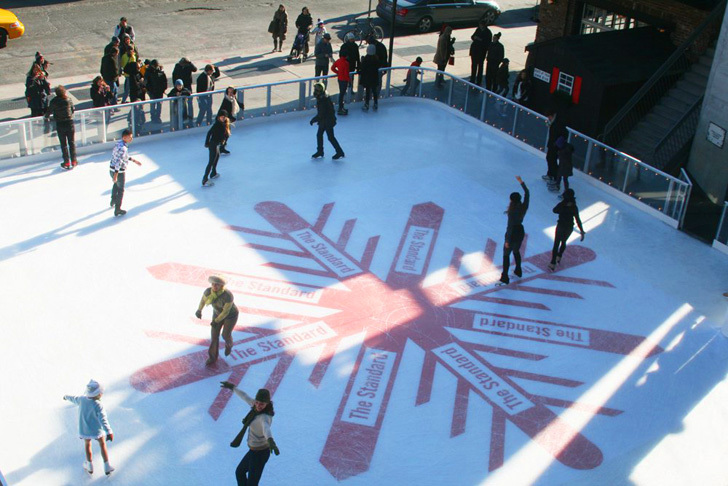 What better way to start rolling in the holiday cheer than with a little ice skating? The trendy Standard Hotel just opened its 3000-square-foot ice skating rink right outside the hotel in the shadow of the High Line. Open all winter long, the rink is the perfect place for outdoor fun for kids and adults (they have a boozy apres-ski menu!) — hit the jump for more details. While ice skating is always a treat for the tots, the Standard takes it to the next level for adults, with a delicious menu of savory treats and boozy delights. The Kaffeehaus is be offering “sweet and savory crêpes and waffles topped with goodness beyond your wildest imagination,” according to the Standard’s blog. Plus, the menu has fondue, grilled cheddar sandwich, and other tradtional snack stand foods, as well as a fabulous looking list of warm wintery beverages like hot chocolate, peppermint tea, egg nog, apple cider, and more. For just $4, you can add a shot of bourbon, brandy, or rum for a little extra warmth. Throughout the season, there will be ice skating lessons, hockey tournaments, and other special events, so check the Standard Culture website for the latest updates. This is the second year for the Standard’s ice rink, which costs $12 a ticket and $3 for skate rentals. The rink is open from noon until midnight Monday through Thursday, from noon until 1 a.m. on Friday, from 9 a.m. until 1 a.m. on Saturday, and from 9 a.m. until midnight on Sunday. It may be a balmy 65 degrees today (hello, climate change), but it's the week after Thanksgiving and that means only one thing: it's time to get in the holiday spirit! What better way to start rolling in the holiday cheer than with a little ice skating? The trendy Standard Hotel just opened its 3000-square-foot ice skating rink right outside the hotel in the shadow of the High Line. Open all winter long, the rink is the perfect place for outdoor fun for kids and adults (they have a boozy apres-ski menu!) -- hit the jump for more details.